Thalassemia is an inherited genetic disorder of the blood in which makes less or abnormal hemoglobin which is a part of red blood cells (RBC) of the body. These low levels of hemoglobin production can make you anemic and show symptoms of paleness, fatigue, tiredness along with weakness. The two main types of thalassemia are ‘alpha’ and ‘beta’. Each of these are further have three types – ‘minor’, ‘moderate’ or ‘major’. If you are a thalassemia minor, usually no treatment is required. But for those who are moderate or major thalassemia patients, they need medical assistance and in severe cases blood transfusion throughout their life. Repeated blood transfusions may lead to high dosage of iron in your body, which can damage other body organs. For thalassemia minor, there are not many diet changes to be followed. However moderate thalassemia with non-transfused patients are usually prescribed folate supplementation along with a moderately low-iron diet. And for those on blood transfusion therapy and chelation therapy (to bind excess iron in the body) are advised to follow a strict low iron diet. They are often advised to have a black tea after meals to reduce the iron absorption from meals. Also remember to add enough calcium to your diet as the bones tend to weaken with the progression this disease. Here are a few recipes to help you sail safely through this ailment. A great snack when kids come back home hungry from school. 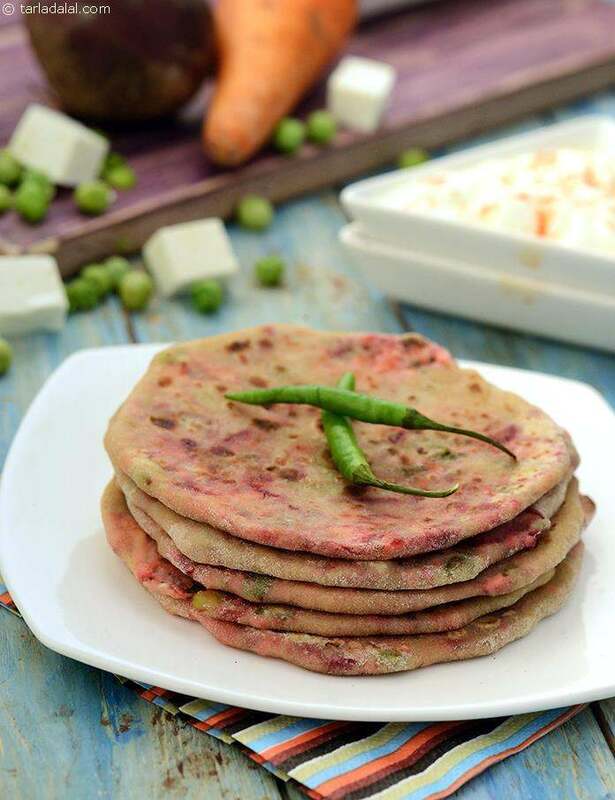 Stuffed with the goodness of paneer and veggies like beetroot, peas and potatoes, serve this paratha hot with a cup of curd. Works the same wonders when served at lunch or at dinner!